Friends & Family Stowaway for Free: From June 15 – July 15, all reservations for two adults in a vehicle will earn the ability to take up to three extra passengers on the ship for free (max party size is five per vehicle). Fast Ferry Fuel Up: Vacationers who sail on The CAT and purchase two-night accommodations in Nova Scotia will automatically earn a $25 Irving Oil gift card. If passengers reserve a three-night stay in Nova Scotia, they get a $50 card. In addition, book by June 15 and receive an Irving Oil Gift Card offering $20 off the ship’s passage from Maine to Nova Scotia. More information here: http://www.ferries.ca/fast-ferry-fuel-up. The CAT Mid-Week Super Saver: If passengers travel on Tuesday or Wednesday through through July 31, they get 25% off round-trip or one-way passenger and vehicle fares. If you book online use promo code CAT16. The CAT Is Back Deals: Travel between June 15 and June 30, 2016 and save $30 on vehicle fares. Offer valid on regular passenger vehicles up to 6’6” tall and 20’ long; book before June 15, 2016, and save an additional $20 on the discounted round-trip passenger fares. When booking online, use promo code CAT16. For travelers looking for hotels and activities to do once in Nova Scotia (kayaking, golf, spa, hiking and more), a host of additional hotel and travel packages can be viewed here. 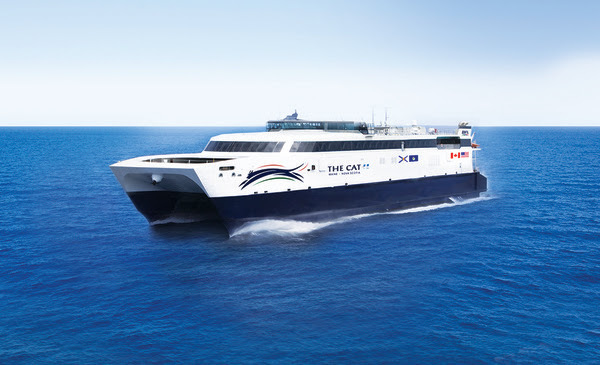 The CAT will make the 212-mile trip (the voyage can take between 5 – 6 hours) twice daily, leaving Yarmouth at 8:30 a.m.and departing Portland again at 2:30 p.m. On-board amenities include a gift shop, movie lounges, kids’ play area, and visitor services area. In addition to enjoying the break from being stuck behind the wheel, passengers will be able to enjoy local Nova Scotia cuisine, entertainment and products. Vessel capacity is 800 passengers per trip, with space for 225 regular passenger vehicles, as well as motor coaches and recreational vehicles. Tickets are $107 (one way) for adults, $102 for seniors, and $65 for children ages 6-13 (all younger children ride free). For those who wish to bring their car onboard, rates start at $199 one way. Dogs and cats are permitted in the designated kennel area (veterinarian-issued certificates may be required). For further details and to purchase tickets, visitwww.ferries.ca or call 1.888.249.7245. The CAT is an international ferry service, so proper international travel documents are required. Passengers are recommended to check with Canadian Border Services Agency (www.cbsa-asfc.gc.ca) and U.S. Customs and Border Protection (www.cbp.gov) for more information.